Ordinary number special code (s) signatures Sommai-Kamjorn VF about 770 - 800 baht. Ordinary number signatures Sommai-Nukool VF about 12,000 baht. Solid number xxxxxxx signatures Sommai-Kamjorn UNC about 15,000 baht. Solid number 9999999 signatures Sommai-Nukool UNC about 41,000 baht. 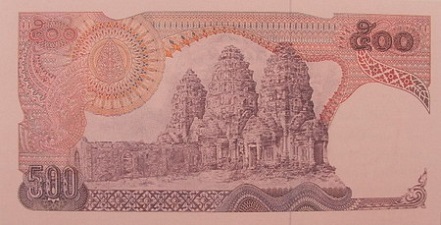 Solid number set 1's - 9's (9 notes) signatures Sutee-Kamjorn UNC about 190,000 baht. Lucky number x00000 signatures Sommai-Kamjorn UNC about 6,000 baht. Untill 1975 Bank of Thailand could issued 500 baht banknotes which Thailand banknote printing works fully managed all process. 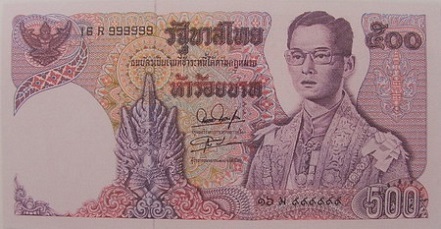 This 500 baht banknote was issued on August 8th, 1975. The main object is the image of the Phra Prang Sam Yod at Lobburi..